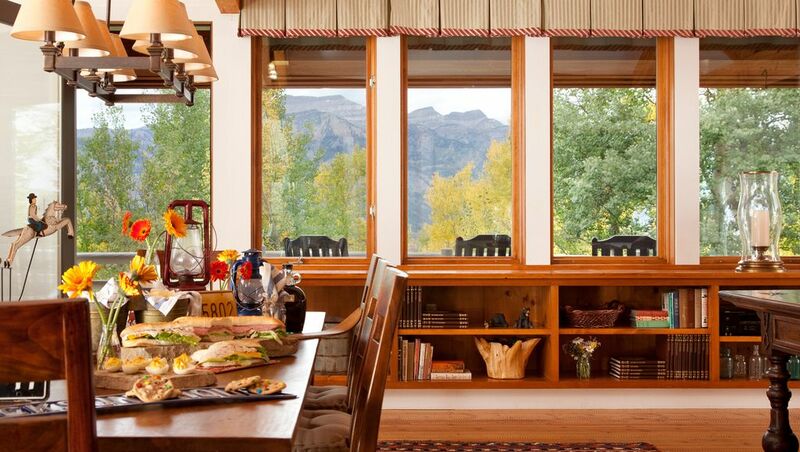 Overlook -– a sweeping, airy, modern house of glass and wood -- sits high on Gros Ventre West, surveying ponds, grassy ranch land and the great, lofty span of the Tetons and the Snake River Range. The dramatic composition of mountains and valley is framed by a continuous wall of glass running along the front of the house, giving Overlook its name and its raison d’être. Groves of rustling aspens encircle the lawns and terraces. Overlook is long and open, and every room is attentive to the incredible panorama outside. The house fills up with light by day; stars crowd the windows at night. A second-floor great room incorporates the living area, dining room and glass-walled kitchen into one bright, handsome space. A smooth leather couch and armchair face a wood-burning, fieldstone fireplace, a spare candelabra illuminates the dining room table. Painted wood walls, rich fabrics and peaked ceilings with exposed beams all add to Overlook’s atmosphere of peaceful simplicity and deep comfort. The big master suite is on the main floor, just steps off the great room. The rustic, hewn-wood king size bed faces a striking, asymmetrical stone fireplace, and terraces line both sides of the room. An oriental rug in gorgeous russets, greens and golds is spread upon the wood floor, and grounds the spacious room in vivid color. In the master bath, windows surround the deep, jetted tub on all three sides, while skylights light up the space from overhead. The master bath also has its own sauna, which opens to the terrace, the trees and the cool mountain air. An open, sunny staircase leads from the great room to the downstairs living area, where a cheery red wood stove, television and big sectional couch create a welcoming, tranquil refuge. Three guest bedrooms are on the lower level -- one, just off the sitting area, has a queen bed spread with a lovely checkered quilt, a door to the grounds and a private bath. The other two bedrooms stand on the opposite end of the house, and share a hallway and a bathroom between them. The first has a traditional brass, queen size bed flanked by reading lights, and a door that opens to the lawns and the hammock. The last is a charming bedroom, perfect for children, with two twin beds waiting side-by-side, spread with matching coverlets. This guest room, like the others, has a private entrance/egress to the outside world and all its untold adventures. Moose, elk and deer graze on the hillside among the aspens, just past Overlook’s deck. Overlook is a delightful, warm, well-furnished house of manageable size, in a truly remarkable setting -- quiet, pastoral and secluded, and yet close to everything. It sits halfway between Jackson and Wilson, and is only 20 minutes from Grand Teton National Park. An afternoon spent on Overlook’s wide hammock, or snowshoeing along the butte with the staggering mountain ranges spread out in all their glory, or dining with family by the blazing fire are all sure-fire ways to reset one’s overlook on life.